Satellite navigation does exactly what its name suggests - it takes readings from satellites orbiting the Earth and tells you exactly where you are on the planet. Then it gives you directions to wherever you want to go. Which has the best directions - taxi driver or satellite navigation? But how does this technology compare to the most fearsome of all navigators - the London cabbie? 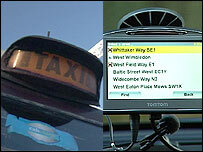 To find out, we pitched the wits of a top of the range sat-nav - the Tom Tom GO 720 - against a black cab. We really wanted to test how good sat-nav was at getting us to a series of waypoints in the quickest time. The latest devices come with traffic avoidance, which means they download traffic information and recalculate the route to avoid traffic jams. They can also find a number of different types of locations, including specific addresses, town centres, road junctions and points of interest. Andy, the cabbie, who accepted our challenge also comes fully loaded with a near encyclopaedic understanding of London roads which is so famous amongst black cab drivers it is just called "the Knowledge". But in his organic brain he also had an extra compartment marked "common sense". We chose waypoints that took us through extremely busy parts of London. We would need to go from Box Hill in Surrey to Wembley Stadium, then the Houses of Parliament and finish at Greenwich Observatory. In fact, if we had just followed the shortest route to our first waypoint - the new Wembley Stadium - we would have gone right through some of the worst traffic blackspots in the area. The rules were simple. Andy the cabbie could choose whichever route he wanted, listen to traffic reports on the radio, and change route at any time. But so he did not get an unfair advantage, he was not allowed to use bus/taxi lanes to avoid any jams. I had to do what the sat-nav said. No exceptions. It was not long before our journey took its first unexpected turn. Instead of taking us straight onto the M25, the sat-nav directed us down a country lane and through Leatherhead town centre - not the most obvious route. We were a little sceptical, to say the least. I was squeezing my car down a windy lane and I was convinced Andy the cabbie would be on the M25 by now. But I was wrong. Andy had chosen to avoid the motorway and was paying the price. After sitting in a queue for quite a while, he decided to turn round and head back to junction 9 of the M25. As Andy decided belatedly to chance the motorway, I was already on it and the traffic avoidance system came to life. Twenty seven miles ahead, it said, there was a 42 minute delay. The sat-nav looked for a quicker alternative route, and found one. Our directions were being voiced by none other than comedy legend John Cleese. 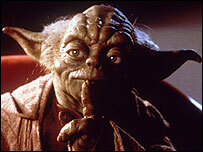 He is one of several famous voices you can pay to download from the sat-nav's website. You can also download free voices elsewhere, although these tend to be impressions. Cleese, however, is the real deal. As both cars got within a few miles, things started to get desperate. I was stuck in a jam which the sat-nav did not seem to know about and Andy was nipping through a petrol station. And then the most fantastic vision. Our first waypoint - the Wembley arch - lurched into view. An hour and 12 minutes after starting, the sat-nav had got us there five minutes ahead of the cab. I punched in waypoint two - the Houses of Parliament - and switched the voice to Yoda, who told me: "the congestion charge you must pay". The sat-nav challenge was in full flow, and it was 1-0 to sat-nav. But the rest of the journey would take us into the maze of London streets, and there, the cabbie was on home turf. The roads were getting narrower and windy, with many turnings, and in this situation I had to pay close attention to the sat-nav directions. With so many turnings in a short space, it was sometimes tricky to work out which left or which right it was talking about. As I headed down Edgware Road, suddenly the cab overtook me. I had lost the five minute advantage and now we were entering the congestion of central London. The sat-nav was keeping us on the extremely busy main road, routing us past Piccadilly Circus and Trafalgar Square. It did not consider the traffic to be busy enough to avoid and so we sat in the queues. To be fair, there were no incidents or accidents on our route. There were just lots of traffic lights and lots of traffic. The cabbie could nip down emptier side streets on a whim, cutting out lights and busier junctions. As we sat in traffic around Piccadilly Circus, an MMS arrived, showing a photo of Big Ben. The taxi was already there. By now, sat-nav was lagging about 20 minutes behind the cab. We came across a new cross-road junction which the sat-nav incorrectly thought was still a roundabout. If I had wanted to, I could correct this information by pressing a few options on the sat-nav. The next time I connected it to my PC, it would upload this correction to Tom Tom HQ. In the end, the cabbie brain won. Andy was already having tea at the finish line by the time we hit waypoint three, the Houses of Parliament. The final verdict - the cab beat the sat-nav by 27 minutes.